The Master of Science in Big Data Analytics for Business is designed to help participants mastering the business knowledge, the methods and the analytical tools to convert BIG data into BIG insights in marketing, finance and operations. The program is offered on a full-time basis and consists of 2 consecutive semesters of courses (September – May) followed by a professional experience (from June onwards). The curriculum is developed around core modules in business, technology, and methodology, as well as specialized courses in marketing, finance, and operations. In a connected world, data provide companies with the opportunity to align their marketing, finance and operations strategy with objective facts and figures. Participants will learn how to become data-driven managers, and will be able to spot analytical opportunities in a given business context. The course tackles the basic principles of the project management field. Project management is a managerial discipline that is inevitable in a data-driven business context nowadays. In multiple industries as diverse as retail, financial services, pharmaceuticals, software and aerospace, analytical projects drive business. Effective project management often translates into gleaming new opportunities that often translate into increased sales. The course fine-tunes the participants’ communication skills of data-driven analyses. Developing analysts’ communication skills helps in all aspects of their professional life; from analytical projects to social gatherings with colleagues and everything in between. The ability to communicate analytical information accurately, clearly and as intended, is a vital life skill for data scientists nowadays, and very often overlooked by a lot of companies. The course gives insight into what makes someone a leader. The answer varies widely depending on who and when you ask. One thing is sure that there are traits experts do agree on, including personality components and acquired skills. One of the necessary skills of a data scientist is the possibility of identifying the necessary characteristics of leadership. The course covers the fundamentals of advanced spreadsheet analysis. In- and out-company data is floating around, and the skills to treat that data in an efficient and effective manner is imposing employees to sharpen their analysis skills. One of the most popular business tools is spreadsheet analysis. This course is composed out of two main blocks, i.e. commercial versus open source business analytics tools. Below one find the joint course content for the two main blocks. The overarching idea is that participants should be able to write SAS and R programs for data management, analysis and presentation. This course covers the concepts of a relational database and the industry standard Structured Query Language (SQL). In addition, this course gives its participants the necessary skill set to visual analytics. This course covers the principles of big data and its tools. Nowadays, due to information technology and the Internet, massive amounts of information are created and stored by companies. The data differs in terms of its volume, variety and velocity. These massive amounts of information are referred to as big data. Big data nowadays dominates the business practices, and how to gain knowledge out of these data is crucial for a lot of organization today. This course introduces its participants to the fundamentals of descriptive and predictive analytics. Nowadays, there is a tremendous increase in customer/company information which is available to the analysts. Indeed, companies are collecting different types of information like social media information, purchasing behavior, complaining behavior, socio-demographic information, etc. Consequently, knowing how to use this information to improve relationships is of high benefit for every analyst, because better decisions are based upon that. This course tries to fulfil the gap by reaching participants new ways to describe data and to interact with customers on a one-to-one basis. The aim of this course is to present a concise description of some popular time series forecasting models that are based on the regression framework. Time series modeling and forecasting has fundamental importance to various practical business domains. The course addresses the topic of how network models are pervading actual business and social life. Social network analysis (SNA) is the use of network theory to analyze social networks. The course aims to introduce SNA as one of the most innovative and successful fields of management research. SNA is a method for representing and analyzing the structure of relationships among nodes of a network. How many friends do you have on Facebook? How do you act in the networks of social relationships? How many followers on Twitter? Are you a LinkedIn user? How many links can you manage? What are the structural characteristics of your social network? Which kind of network relationship could provide the best chances to find what you are looking for? The same kind of questions can be applied to the business environment in order to understand how companies are dealing with the increasing number of relationships they have to manage (alliances, customers, suppliers, employees, etc.). The purpose of this course is to give the participant a theoretical and practical introduction of the different phases of a traditional marketing research analysis project. The participant learns how to build, execute and report their own marketing analysis plan. In this course, you will learn about the design of recommender systems: the underlying concepts, design space, and tradeoffs. A participant should understand the design space of recommender systems and be able to provide design recommendations for a particular application domain, as well as critique a design to point out its strengths and weaknesses. Back in 2000, it was estimated that the world’s codified knowledge would double every 11 hours. That estimate, while significantly shorter than previous ones (e.g. in early 20th century it doubled every 30 years, and in the 1970s it doubled every 7 years; source: Bontis, 2001), is exponentially larger than current rates of growth. For example, the blogosphere alone doubles every 6.5 months (source: Technorati, 2010). In the Web 2.0 era, individuals and companies are learning and adapting the way they communicate. For Marketing that has translated in an explosive growth in the popularity of social media to reach, engage, and grow the relationship with prospective customers. This course affords you the opportunity to learn and analyze the new media that are transforming the business landscape. You will walk away having analyzed digital media data, mainly coming from social networks like Twitter. This course introduces the participants in the field of credit scoring. Nowadays, various information is available within the organization to focus on a data-driven approach to assign a credit risk to consumers of the company. The objective of this course is to introduce participants to the use of the Bloomberg Professional and Thomson Reuters EIKON services available in the Financial Markets Labs. At the end of this course, participants can take the first part of the certification exam. The course provides an overview of Business Process Management as both a management discipline and as a set of enabling technologies. The course teaches the participant the key concepts, terms, methodologies, techniques, and technologies in BPM. It describes what a process is, what process modelling, analysis and design are, and what process management is. It provides an overview of the tools and technologies used to support the BPM discipline including process modelling tools. This course provides an applied perspective on Mathematical Programming (MP), instead of focusing on algorithms. In particular, it serves 3 purposes: (i) providing a selective catalogue of practical MP problems faced by managers, (ii) linking these problems to the different types of mathematical optimization methods, (iii) formulating MP problems and interpreting their solutions within a spreadsheet. IÉSEG is proud to be partners with Capgemini and SAS for its MSc in Big Data Analytics for Business program. These partnerships with some of the world’s foremost leaders in data science and analytics enriches participants’ views on big data analytics for business. Partners will share their expertise, professional perspectives and insights on current trends in their field of expertise with participants through coaching sessions, guest lectures, real-life case studies and company visits. The opportunity to learn about concrete professional issues from business leaders and to gain exposure to the real-world experience of successful practitioners is a key asset for participants. 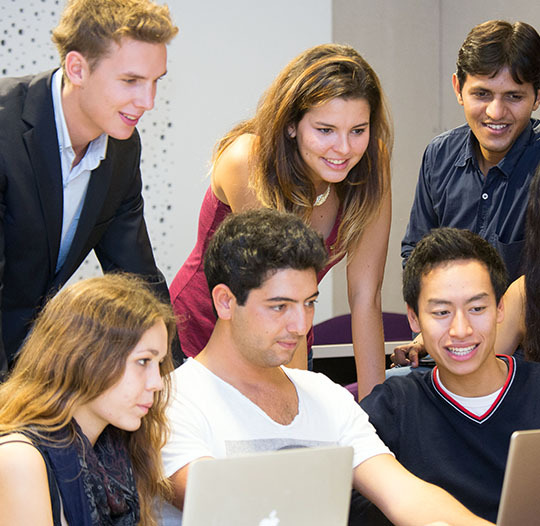 The MSc in Big Data Analytics for Business offers its participants a real-life capstone project at the end of the academic year.This project has the intention to put the competences and skills absorbed over the academic year into practice. In collaboration with a company, participants have the opportunity to solve real business problems using the various techniques and methods that they have acquired. Last academic year, the capstone project was organized in the form of a data science hackathon with Crédit Agricole, a leading French financial services provider.